Luxury level comfort, professional support and safety, rugged durability and a fierce appearance make these gloves some of the nicest on the market. It’s ergonomic design will allow you to feel the power in your punches while still remaining agile. The tried and true hook and loop securing system means your glove won’t shift around when you use it. The liners in the hand combined with the inner mesh help fend off moisture so you can fight longer and harder without building up too much slippery sweat. This pair of beauties costs a pretty penny, with the smallest sizes costing in the range of $100. For those not looking to spend a great deal of money on their gloves, this pair may not be the best match. But if you want performance, durability, quality and an all-around awesome looking pair of gloves, then the TITLE Gel Intense gloves are exactly what you’re looking for. 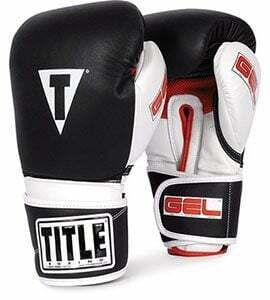 Title makes some of the best boxing gloves available today, and their TITLE Gel Intense Bag/Sparring Gloves are one of their finest pairs. Available for use in both sparring and bag training, this adaptive pair of gloves will meet and exceed all of your needs as a boxer. When you slip a pair of Title gloves on and throw a few punches, you’ll know immediately that you’re wearing one of the finest professional grade gloves in the world. Right off the bat, it’s easy to see that these full-grain leather gloves are tough as nails. The combination of GEL®, high quality leather and ergonomically optimized foam padding allows these gloves to take blows and heavy usage without wearing out or hurting your wrists. 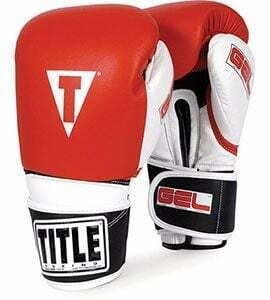 Buying a pair of TITLE Gel Intense gloves seems like quite the investment, but you’ll get back every dollar you spend in pure professional performance that you could only expect from a brand-name glove such as this. These gloves aren’t likely to fall apart under any normal circumstances. If there’s one thing that can be stressed about this pair, it’s that quality is the key to its design. The craftsmanship is incomparable and can only be compared to the legendary Winning gloves. This explains why some boxers claim that these are the “world’s greatest gloves”. The perfected design of these Title Gel gloves virtually eliminates knuckle and wrist pain. If you use hand-wraps, you’ll be able to go home after a long session and be ready for another the next day. 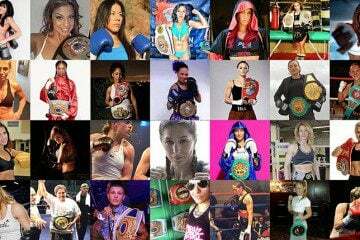 This is the kind of protection you’ll only find on world-class boxing gloves built to protect you as if you were a professional boxer. These gloves sport a very intimidating design, plus the plainly visible TITLE logo at the top of the palm means that everyone will know that you take your gear very seriously and settle for no less than professional grade. Available in either black or red themes, this pair has something of a sportscar look with red lining and white along the inside of the palm. Do you own these gloves? Fell free to leave a comment bellow! This Is Very Grate Information That You Providing .